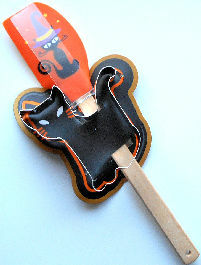 Here is a silicone spatula decorated with a Halloween cat. A large cat cookie cutter is attached. The spatula is 12 3/4" long. The cookie cutter is 4" square. Hand wash. New.